This is a great wine competition held in Rochester, New York, as a charitable event benefiting 'Camp Good Days and Special Times, Inc.', that provides benefits to children and their families that have had cancer or another life-threatening event in their lives. They allow entries from commercial wineries located in all of the wine-producing countries around the world and the event has the broadest list of categories of all of the competitions we include. In 2008 there were just under 1600 wines awarded medals by the judges. The Finger Lakes competition offers the 4 standard medal levels: Gold, Silver, Bronze and Double Gold. The Double Gold must be a unanimous decision of the judges, all of whom are wine professionals. The competition also awards 2 special wine awards for the highest rated Riesling, the John Rose Award, and the highest rated true Ice Wine, the Crystal Grape Award. Take a look through the results and expand your wine horizons to include some wines you have probably not heard of or seen in the California Wine Scene. And if you happen to be in the Rochester New York in early May, you may want to give the dinner and tasting a swirl! We include results from the 2006, 2007 and 2008 competitions in our full database. 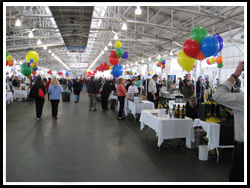 The Monterey Competition, which is part of the Salinas County Fair, has an unusual approach for a California County Fair; they allow wines from any commercial winery or private label wine produced by a professional winemaker with no restrictions on country of origin. Award categories are the standard Gold, Silver and Bronze with sweepstake awards for best of show in the white, red, spirits, sparkling and dessert categories. Most of the judges in the Monterey Competition have worked together on this event for almost a decade and are all wine professionals including winemakers, restaurateurs, wine journalists, etc. There is one chief judge who is responsible for coordinating the individual judges and arbitrating any disagreements on results. All wines are tasted blind and results are based on what is expected and accepted as a style for that particular wine. In 2006 there were 1170 wines submitted and 683 medals awarded. There is a tasting event that takes place to showcase the award winning wines as a part of the Salinas County Fair in May each year. We include results from the 2006 and 2007 competitions. Started in 1855, this is the oldest wine competition in California and certainly one of the state’s most prestigious. 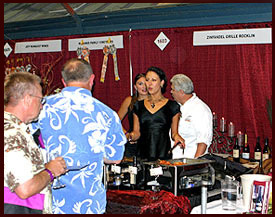 Entrants are restricted to grapes grown and wines produced in California. The one exception to the rule is if the wine producer is in one of the neighboring states of Oregon, Nevada or Arizona and 75% of the grapes used in the wine are from California. The wines are categorized into groups of similar wines and tasted together as a group and each judge identifies which wines he/she feels should receive gold, silver or bronze medals. The results are entered into a computer and given a numeric score. The score is based on the following: Bronze 85-87 points, Silver 88-93 points, Gold 94-98 points, Double Gold 97-99 points. In addition, if all four judges give a wine a gold medal the award will be raised to a double gold medal. The computer will identify the highest scoring wine in each of the varietal categories for each of the eleven wine districts in the state and that wine is then the winner of the “Best of Class of Region” award for the wine’s varietal class (Zinfandel, Chardonnay, etc.). The Best of Region and Best of Show awards are based on further tastings of the Gold and Double Gold award winning wines. The Winery of the Year award is given to the winery with the greatest number of winning wines with the highest awards won as well as the percentage of wines entered that won an award. One interesting twist of the California State Fair is that they also recognize the vintners that produce the grapes for the award winning wines. These vintners become eligible if the wine carries an estate bottled or single vineyard designation on its label. We include the results for 2005, 2006 and 2007 competitions in our database. We have captured the results from two local county fair wine contests in our medals database; El Dorado and Amador. These competitions get a great deal of participation from local wineries making them an excellent way to get information on foothill wines. 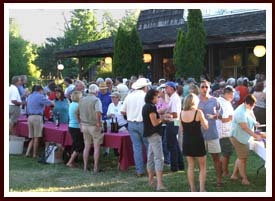 The focus of these contests is generally on California wineries and fruit grown in California, or Foothill sourced fruit. Sometimes, as in the case of El Dorado County there are restrictions on the size of winery that can submit entries for most classes if they are from outside of the Foothill region. There is one large exception in El Dorado, the Rhone Varietal category allows entrants from any winery of any size located anywhere in the world. We include the 2006 results for three counties, the 2005 results for El Dorado County, and the 2007 and 2008 results for El Dorado and Amador. The Dallas Morning News began sponsoring a wine competition in 1985 that was originally restricted to wines made in the United States. The restriction on country of origin was lifted in 1999 to allow wineries in countries throughout the world to enter the contest. The participants now represent 24 states and 16 countries. The competition has grown in prestige as it has grown in entrants and the number of wines judged has risen from 570 for the first year to 3320 in 2008. The wine competition is held every year in Dallas and is judged by wine professionals who work in the business on a daily basis. The wines are kept in a room separate from the judges and are all given a number. The wine glasses are then numbered to match the wines and delivered to the judges to ensure anonymity. We include the results for 2006, 2007, and 2008 in our full database. This San Diego based competition has been in existence since 1982 and is open to commercial wines from around the world. The competition is sponsored by the charities of the Social Service Auxiliary of San Diego. As a condition of inclusion in the contest each entrant must agree to donate a case of any wines that win awards to be auctioned later in a benefit for those charities. The more than 40 judges are wine professionals and most of them are veterans of either this competition or other similar competitions. In 2006 awards were given to 1,232 wines from throughout the world. The Competition began as the Cloverdale Citrus Fair Wine Competition in 1983 as a competition between the wineries of three local counties. The Chronicle began its sponsorship of the competition in 2000 and tasting moved from Cloverdale to San Francisco. The wine regions allowed to participate grew from the original 3 counties to all of Northern California by 2001 and now includes wines from all wine regions of the United States. In 2008 over 3500 wines received awards from the over 1500 wineries that sent in entries. This is the largest competition held today to showcase American wines. The Chronicle Competition utilizes panels of 5 wine professionals as judges for each individual group of tastings. The wines are brought out blind and the panel discusses the wines. The panel then comes to a consensus of what, if any, award the each of the wines should receive. We include the results for the 2005, 2006, 2007 and 2008 competitions. This is the largest US wine competition outside of California, including more than 3,000 wines representing the greatest wine producing regions in the world. The wines categories included are not just your standard European varietals and classes, but also includes fruit wines and Native American varietals more commonly seen in the eastern and mid-western United States then in California. Founded in 1992, the competition is work of the State Fair and the Enology department of Purdue University and has a distinquished panel of wine judges from around the United States. Like many other major competitions, there is a tasting offered of the award winning wines, generally held in early August. Check our links page to get to the official website for more information. We include the results from the 2006 and 2007 competitions in our master database.